Who Do You Sue When Your Rideshare Driver Crashes? For thousands of years, the only way to move around was by foot or through animal power. Now, with a few presses on a smartphone using a rideshare app, an individual can call a driver to take him/her anywhere. This convenience has revolutionized the way many people conduct their lives, but cannot remove the inherent risk that comes with traveling in a vehicle on a roadway, nor the risk of being in a car accident. Driving is not an easy task and requires practice, skill, and awareness to avoid making bad decisions that can lead to collisions. Common sense would dictate that if a rideshare driver was at fault for an injury, the injured rider and other crash victims would seek compensation from rideshare company, as the entity who represented the driver was safe to transport passengers. However, because of the way rideshare companies are structured, answering the question of who is legally responsible is difficult. Given the widespread use of rideshare drivers, understanding one’s legal rights in a car accident for recovery is vital, and an overview of how Illinois handles this issue will follow below. Drivers use their own vehicles, are personally responsible for maintenance, and are classified as contractors in most states, rather than employees. This means drivers often try to use personal insurance policies to provide liability coverage for personal injuries in the event of an accident. Difficulties with this approach arise because most auto insurance companies do not want to cover drivers under personal policies, and commercial insurance is expensive. Insurance companies tend to drop coverage for rideshare drivers that use personal policies for commercial activity. New rideshare insurance policies now exist, and Illinois requires rideshare drivers to maintain minimum coverage for accidents that happen while they are working. However, what counts as working is not always easy to define because drivers often drive around waiting for rides, and must take time to drive between passenger pick up points. Uber includes a $1 million liability policy for verified rides, but if a ride is not verified for some reason, the driver’s insurance limit would be the only amount available for compensation. Illinois attempted to eliminate a lot of the confusion around liability for rideshare accidents by enacting a law in 2015 that requires drivers to have insurance coverage for the time he/she logged into the app but awaits a rider, and then shifts the insurance requirement to the rideshare company once a passenger enters the vehicle. The liability limits differ in each situation, with $50,000/$100,000 for death injury without a passenger, and $1,000,000 when a passenger is being transported. 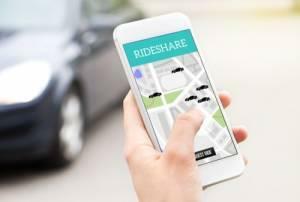 The rideshare company’s policy should cover the passenger even if another driver is at fault and has no insurance through its uninsured motorist coverage. However, collecting under the rideshare policy can be complicated if the driver is not using the app properly, or engages in grossly negligent behavior that is outside the scope of his work as a driver. Employers are normally responsible for the actions for their employees, but since rideshare drivers are independent contractors, the rideshare companies will often try to argue they are not responsible for negligent driver behavior. Evidence of inadequate background checks or the possession of information that should indicate the driver poses a risk can overcome this claim, and working with an experienced car accident attorney can help to ensure compensation for injuries is received. You should be able to trust the drivers you hire for transportation, and if you were injured in an accident because of negligence, talk to a car accident attorney today. Rideshare cases are complicated, but winnable if the right attorney is handling the claims. The skilled DuPage County car accident attorneys at the Mevorah Law Offices, LLC have the knowledge, skill, and resources to investigate and build your case. Contact our office at 630-932-9100 for a free consultation.